April 11, 2015: two photographs have been added, thanks to a relative. Information on them is in bold type. 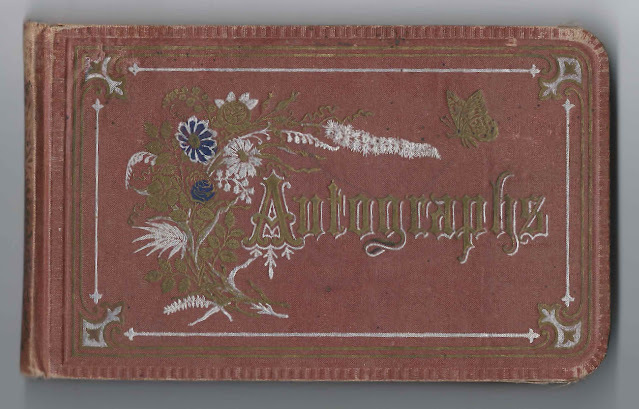 1882 autograph album that Louisa Emma Sherrer kept in the months before her marriage to Francis Edward Lawrey; on her marriage record she gave her name as Emma Louisa Scherrer. Edit of April 11, 2015: Photograph of Louisa included on her marriage certificate shown farther below, provided by a relative. 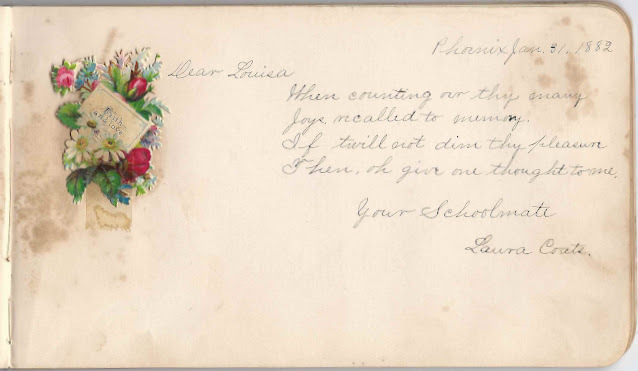 The album is approximately 7" x 4-1/4" and contains the sentiments of 21 of Louisa's relatives, friends and schoolmates, from Phoenix, Arizona, and Independence, California, reflecting, apparently, her parents' divorce. An alphabetical surname list and an alphabetical list of the signers appear at the end of this post. Louisa Emma Sherrer, or Emma Louisa Scherrer, was born 18 October 1865 at San Bernardino, California, the daughter of Carl Scherrer and Frances (Leach) Scherrer, "Fanny", who were born in Bavaria, Germany, and in Canada, respectively. An online tree gives Carl Scherrer's parents as Wilhelm and Maria Anna (Schmitt) Scherer, who both died in Germany and presumably never immigrated to the United States, but I don't know that for sure, nor am I positive of their names. Carl's three sisters also emigrated to the United States and lived in California. I found a reference online to Frances "Fanny" (Leach) Scherrer's father, Francis Sawyer Leach, who was born in Maine about 1808, moved with his family in his infancy to New York and then at some point to Canada, where he married Fanny's mother, Abigail Green, and to California. He was a miner enumerated on the 1850 Census of Sutter, California, living at the minefields, away from his family of wife and two daughters, one of whom was newborn Fanny. There would be three other children. If anyone has more information about the family history of Francis Sawyer Leach, please leave a comment or contact me directly. Thanks! I believe Louisa had two brothers, Louis N. Sherrer and Frank Carl Sherrer. 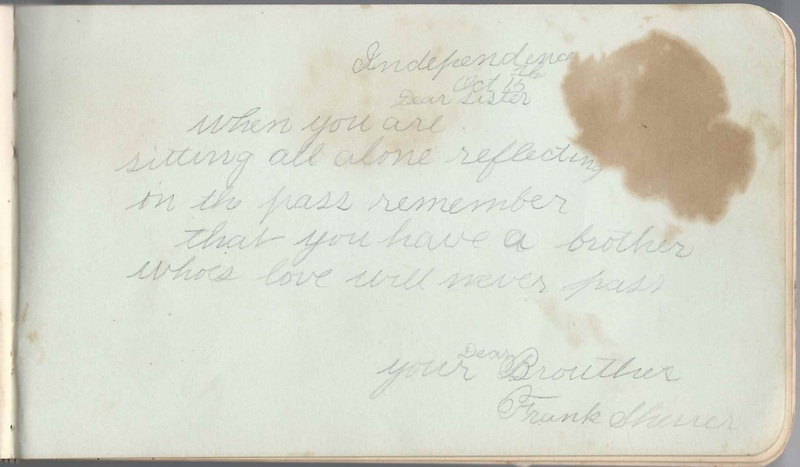 Frank Sherrer signed a page at Independence, California, on October 15, but he didn't write a year. Sadly, Louis wasn't able to sign a page in the album as he had died on March 6, 1881 at the age of 12 years and six months, as a memorial page in the album indicates. It appears that Carl and Fanny had divorced sometime between 1870 and 1878, at which time Fanny married Elijah Robinson, a farmer at Independence, California, in Inyo County. Fanny would have at least two more children; she died in 1886. Laura Coats signed a page at Phoenix, Arizona, on January 31, 1882, and called herself Louisa schoolmate. 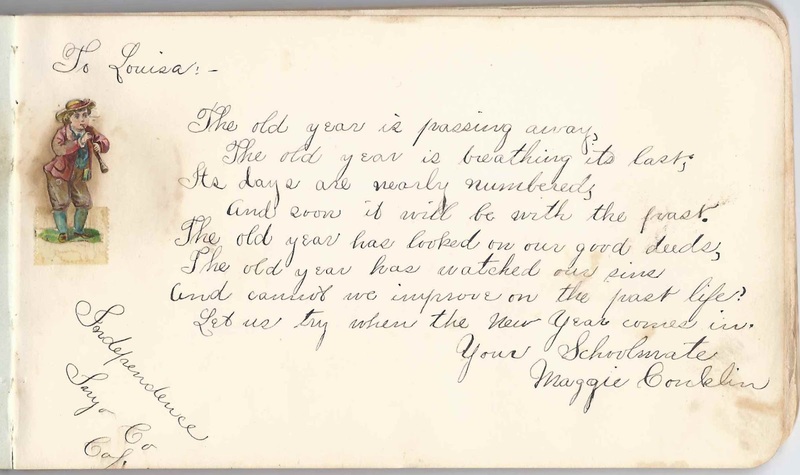 Maggie Conklin signed a page at Independence, California, and called herself Louisa's schoolmate. 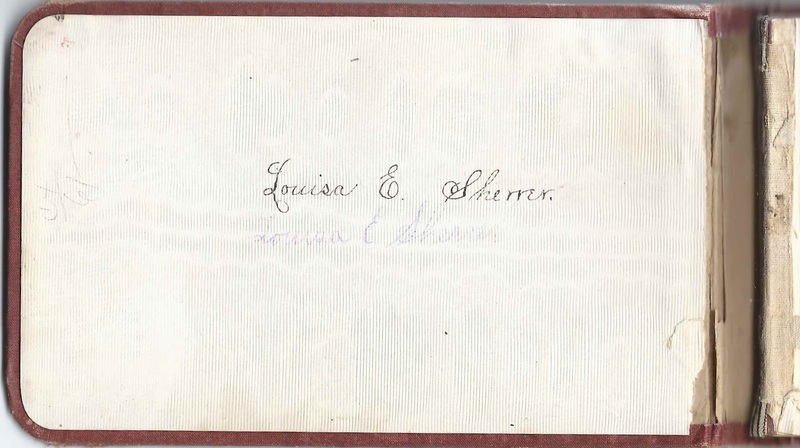 On December 25, 1882, at Phoenix, Arizona, Louisa Emma Sherrer, or Emma Louisa Scherrer, married Francis Edward Lawrey, "Frank", son of Amos G. Lawrey and Margaret Elizabeth (Dickenson) Lawrey. A relative has uploaded an image of their wedding certificate, which has photographs of them, on a tree on Ancestry.com, as well as other photographs of the family. 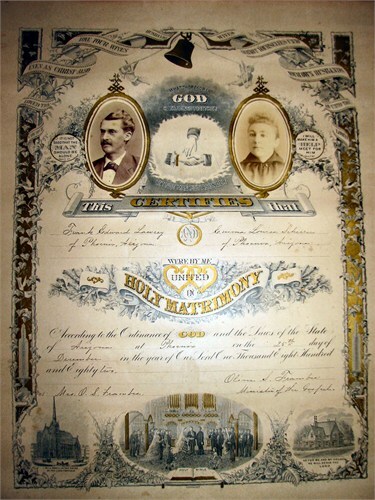 Edit of April 11, 2015: A descendant has graciously given permission to add this image of the marriage certificate of Louisa and Frank; the relative's description and transcription follow. Marriage Certificate for Francis (Frank) Edward Lawrey and Emma Louisa Scherrer. Note the spellings of their names as I've had several question me on this. I will consider, based on this document, the last name of Lawrey is spell as shown upon this document for both Francis and his father Amos Giles Lawrey. Louisa and Frank moved to Pacific Grove, California, where Frank was working as a butcher in 1900 and as a cement contractor in 1910. They had at least one child, a daughter Della, born 29 January 1884, who would marry Edmund L. Brownell in 1904. Frank died in 1915, and Louisa in 1920. If you have corrections and/or additions to the information above, or information on any of the signers listed below, please leave a comment or contact me directly. Thanks. W. H. "Others for others but you are mine, The one fair woman beneath the sun." E. Collins; presumably the same E. Collins who presented the album to Louisa. Author Perkins, signed at Independence, California, in Inyo County; did he mean Arthur Perkins? N. Rosenthal, signed on May 3, 1882; possibly Nathan Rasenthal, who was born about 1853 in Germany but was living at Phoenix, Arizona at the time of the 1880 Census. G. H. Rothrock, signed at Phoenix, Arizona, on July 24, 1882. Presumably the photographer who operated in California and Arizona in the 1870s and 1880s and was in partnership with Charles H. Barnett at Phoenix, Arizona, from 1882-1894. Louisa E. Sherrer, album owner. She wrote her name on the inside front cover. Other records show her as Emma Louisa, with her surname variously as Scherrer and Scherer. 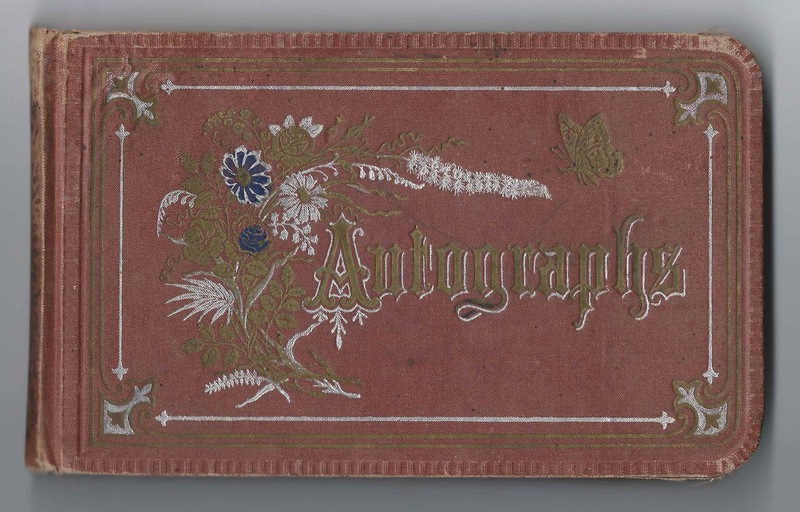 The album was presented to Louisa by her friend E. Collins, who also signed a page in the album. 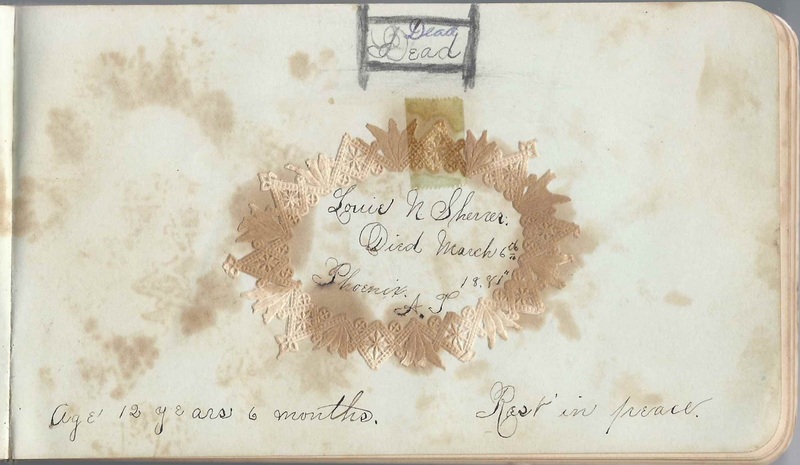 Memorial page for Louie N. Sherrer, who "died March 6th 1881, Phoenix, A.T. Age 12 years, 6 months. Rest in peace." 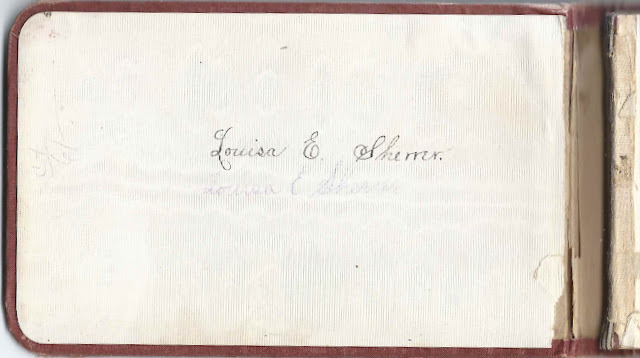 Frank Sherrer, signed at Independence, California, on October 15 [no year written]; Louisa's brother Francis Carl Sherrer. Ada Wharton, signed at Phoenix, Arizona, on January 30, 1882. 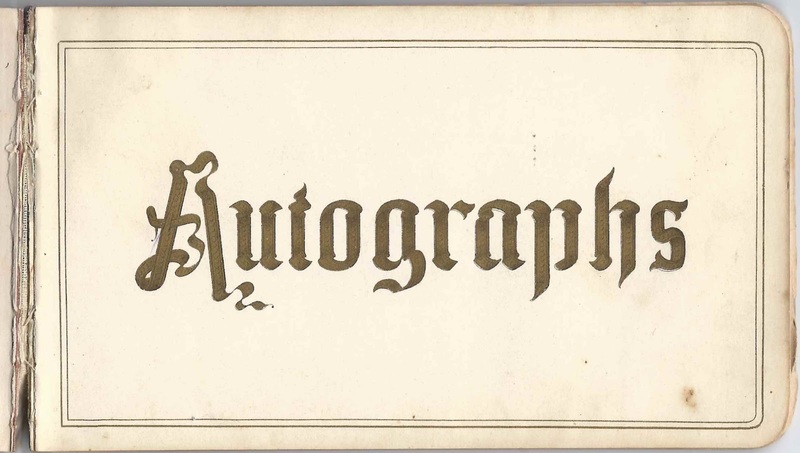 Her brother Henry L. Wharton also signed a page in the album. 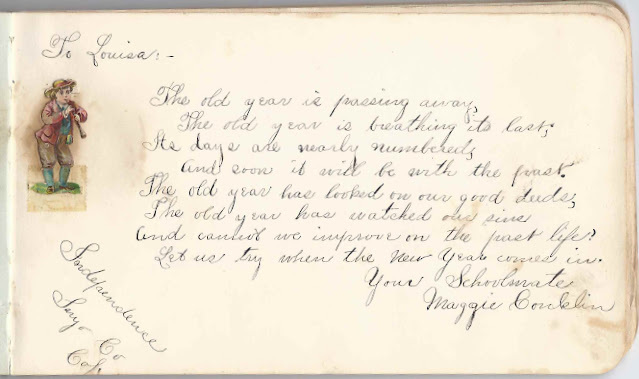 Henry L. Wharton, signed at Phoenix School on February 2, 1882. His sister Ada Wharton also signed a page in the album.